Julian Charles: Hello everybody. Julian Charles here of TheMindRenewed.com, podcasting to you as usual from the depths of the Lancashire countryside here in the UK. Today is the 14th of August 2014, and it’s my great pleasure yet again to be speaking to Kevin Ryan, who many of you will remember joined us earlier this year to talk about his book Another Nineteen : Investigating Legitimate 9/11 Suspects. Today of course we’re going to be speaking about a different area of 9/11 research, but just before we get on to that, let me remind listeners about Kevin. Kevin Ryan is one of the most widely respected 9/11 researchers. In 2004 he was fired from his position as Site Manager for Environmental Testing Division of Underwriters Laboratories for asking questions about that company’s testing of the World Trade Center construction materials, as well as that company’s involvement in the WTC investigation being conducted by the National Institute of Standards and Technology. Since being fired for asking questions, he has held prominent positions with many scholarly 9/11 research groups, co-authored several books and many peer-reviewed scientific articles on the subject, and he continues to give many presentations and interviews. Kevin, it’s great to be speaking with you again. Thanks very much for joining us on The Mind Renewed. KR: Yes, I’d be glad to. My investigation into 9/11 began simply as a series of questions about things that were happening in my country, the United States, in 2003. It was born of the justification for the original Iraq invasion – the Iraq War – in 2003. It was clear to me that the justification for that invasion was based on false premises. The Niger Document about yellow cake, the aluminium tubes – these were coming out as false, even at the time when my Government was using them to justify a war. So I wondered when that sort of deception began; and it made me recall some comments made by the CEO of the company where I worked, Underwriters Laboratories, who had told us when he visited our location that the company had tested and certified the steel used to build the World Trade Center Towers. That got me interested in the story of what happened on 9/11, because 9/11 was really the driving force behind this new War on Terror that was doing so much to change our values, and doing so much in general around the world. So I began looking more into the events of 9/11 and learned that there were really quite a lot of serious questions about how the three building – three skyscrapers at Ground Zero in Manhattan – had fallen. I began to ask more questions about that testing that our CEO had referred to. It would have been testing done forty years earlier when the buildings were constructed to ensure what’s called fire resistance. This is a kind of testing in which floor assemblies and column assemblies are put into a big testing furnace, and they’re tested per a standard called ASTM E119, which rates the components for a certain amount of fire resistance. In the case of the WTC Towers they were tested to the 1968 New York City code which required that the floors would withstand two hours of intense fire in the furnace, and that the columns would withstand three hours of fire in the furnace. One of the big contradictions with the facts of 9/11 is that one of the Twin Towers completely collapsed in only 56 minutes which, given that the official account was a fire, contradicted the facts of what happened. So after a year of questioning my company, I ended up writing to the Government agency NIST (the National Institute of Standards and Technology), asking them about the investigation that they were conducting and that my company was helping with, and asking them to clarify some of these contradictions. I was fired from my job for having done that. I went on from there to become a researcher into 9/11 in my spare time. I spent the next ten years (almost ten years so far) going into great detail into the events of 9/11 – not just at the World Trade Center, but otherwise as well. 7/ instability then spread around the exterior of the building. KR: Well, let me step back just for a second and mention that this was the only time in history that any building had ever collapsed completely from fire. On that day three instances – the only instances ever – occurred. That’s why we’re looking at the evidence that the Government would present for this explanation that would support the political policies; and we’re looking in detail. So, to begin with the columns being severed: NIST did admit that only a small percentage of the columns were severed. It was 14% of the columns in the First Tower, and 15% in the Second Tower. (When we talk about columns in the Towers, we’re talking about 47 core columns – very supermassive core columns – and then over 200 perimeter columns.) So when 14% were severed, that left far more capacity of the building to support its own load. This was made clear by the design claims from the original engineering design, and reported in the Engineering News Record back at the time when the buildings were constructed. The original design claims included that one could cut away all the first story columns on one side of the building and part way from the corners of perpendicular sides, and the building would still withstand its loads in a 100-mile-per-hour wind from any direction. That really puts this 14% and 15% column loss in perspective. The design claims show that 25% of the columns could be lost without problem. JC: Let me throw in here something I mentioned to you before the interview. Bažant and Verdure wrote an article in 2007 called Mechanics of Progressive Collapse, in which they looked at the Twin Towers collapses. In it, they say that 13% of the total 287 columns were severed, but they also say: “…and many more were significantly deflected.” What that means I’m not quite sure, but then they say: “This caused stress redistribution, which significantly increased the load of some columns, attaining or nearing the load capacity for some of them.” So they’re giving the impression there that there was this extra deflection of columns, which goes beyond this 13/14/15% that you’ve just talked about. JC: You quote from one article – written, I think, by those who were actually involved in the design work in the first place back in the 1960s – that these loads on some of the perimeter columns could be increased by more than 2000% before failure occurs. KR: That’s right. That was part of the Engineering News Record reports as well. One thing to remember is what the people who designed the building said. In 1993 (after the 1993 bombing of the WTC Towers), John Skilling, who was Lead Engineer for the design of the buildings, said that, given the exact occurrence of a jet airliner impacting the Towers (even though a lot of people would die because of the jet fuel fires), the Towers would easily withstand an airliner impact. So the people who designed the Towers did not think that an airliner impact would bring the Towers down. The loads, as you said, would be redistributed, given the loss of columns, [but] the safety factor – the over-design of the building – was so great that column loads could be increased more than 2000% according to the Engineering News Record. So far, these first two steps – and I think NIST agrees – are not the critical factors that NIST gave for the collapse of the buildings. At this point in our discussion there’s nothing that would lead us to believe that the Towers would be the first instances of total global collapse from fire. JC: Things really start to kick in with their third point, on fireproofing, which they say was “widely dislodged”. On the surface, that looks reasonable: If a large Boeing 767 were to plough into a building, one might expect something like fireproofing – which one might imagine to be quite flimsy – to be stripped away, such that the fire would have a chance to do its real damage. But what kind of evidence did NIST produce to suggest that that really happened? KR: Yes, I cited calculations done by engineers at MIT. They had done very detailed calculations earlier, before the NIST report came out, showing where the kinetic energy was consumed in the impact, how the aircraft was torn apart, and how the columns were severed. All that made sense at the time. But then when the NIST report came out, and they added this additional appendix, they had an energy deficit. There was no extra energy for all of the shotgun blasts. Frankly, they would have had to strip the fireproofing from huge section of this acre-wide building – five floors worth of building. KR: Yes, I think I know what Dr. Legge was referring to, and I believe I’ve seen the video of the test he mentioned. When we talk about the 767 slamming into the Towers, we’re talking about a plane coming through this perimeter wall, and it has a lot of area to work on, right? In order to support the official story it has to sever the columns; as it’s severing the columns and also moving between the columns, it has to be converted into tiny projectiles (I assume people know what shotgun pellets look like); and then it has to move across a wide area of the building, and from multiple directions be able to shear off fireproofing using shearing forces. So, at this point, it is certainly not proven by any means. But there is a video from Purdue University – another group connected to the official accounts – that shows an animation of what happened, in which it’s very clear (from their perspective) that the debris particles that were created were rather large; they were not small and pellet-sized at all. JC: Let’s turn to step 4, which is the softening and the sagging. This is where the explanation suggests that the floors themselves began to sag due to the extreme heat. They did something called a “paint deformation test” to establish this. What was that test? Can you describe what they did with that? KR: Yes, this is one of the first things that I questioned when I wrote to the Government agency NIST. They had done what is basically a paint-cracking test. They had built a calibration curve by taking steel samples – some of the few steel samples that were saved from the Towers – and they had painted them with WTC primer paint that would have been used on the columns. They exposed those pieces to a range of temperatures, and therefore built this calibration curve with which they could compare the actual materials that were found. They found that the samples that were saved – that had been exposed to the actual fires in the WTC Towers – had seen a temperature of only about 250° centigrade, or Celsius. That’s quite low given the kinds of temperature effects that NIST implies. (250° Celsius is about 480° degrees Fahrenheit.) None of the temperatures reached the 600° Celsius which has frequently been cited as a point at which steel loses half of its strength. (That’s not critical, given that the design of the Towers allowed this huge safety factor as we discussed before.) None of the steel samples reached even the point at which half of the strength would have been lost. When we’re talking about what steel they took and did this comparison with, NIST said it was selecting samples from an enormous amount of steel, and that they were looking at regions of impact and fire damage in that sample selection process. So, given the low temperature result, the 4th step of this collapse initiation sequence – that these temperatures weakened the columns and the floors – doesn’t hold up in terms of examination of the evidence. So, it’s a strange question: To what temperature would it have to rise to meet the predetermined objective of NIST? The fact is, the floors in these test models did not do what NIST was implying they might do. You could see in the pictures that after 45 minutes, and even after the tests were finished, the floors had barely sagged at all. JC: And yet, when I turn back to that article by Bažant and Verdure, they say that “[b]ecause a significant amount of steel insulation was stripped” – (they make that claim) – “many structural steel members heated up to 600°C”. They then go on to say that “at 600°C” “about 85%” of the yield strength is lost. So they’re claiming that many structural steel members did in fact get up to that temperature. KR: Yes, as we see in the NIST Report – the NCSTAR1-3C and NCSTAR1-3E reports – the physical tests show that none of the steel samples taken from the Towers reached a temperature of 600°Celsius. So there is absolutely no evidence for what professor Bažant is contending. None of the steel recovered from the WTC Towers and tested by NIST reached the temperature of 600° Celsius; there is simply no physical evidence for that contention. KR: No, I don’t buy it, because I’m looking at the direct evidence, not at hypothetical statements as Bažant and company are doing. If you look at the actual physical evidence – again, from the tests that my Company, UL, did on behalf of NIST for their investigation – you see that, when the floor assemblies were put in the furnaces and tested for the standard test, the sagging of the floors was only about 3 inches in the middle of the 35-foot-long span of floor assembly. This was with basically all the fireproofing removed. They had a series of models made with decreasing amounts of fireproofing applied, and even the one that basically had no fireproofing on it only sagged about 3 inches in the middle, and the major joist parts did not sag at all. The problem with the NIST report is that, with all these physical tests failing to support their contentions, they turn to a computer model. (By the way, NIST is not willing to share that with the public.) They show these computer model images in their report, and they turn this 3 inches of sagging into a dramatic 42 inches of sagging, with the joists bending down severely. At this point, it really begins to show that NIST was more political science than physical science; people begin to believe that they were intending simply to support the political policy of their bosses. They reported directly to the Department of Commerce, and to the President, so it’s not terribly surprising to some people that they would do this sort of thing. To turn away from the physical evidence and create a computer model that contradicts the physical evidence (and which they’re not willing to share with the public) – that’s where we begin to believe that we are looking at scientific fraud. KR: I really do, and obviously as we stated there’s no physical evidence that the fireproofing was stripped off. Even if it had been, the floor models test show that the floors would not have sagged as much as the computer showed they did. The steel temperatures did not reach 600° Celsius per the steel temperature tests, so obviously that’s incorrect. And the 90 minutes is twice as long as – according to the NIST Report – the areas of failure could have seen. The fires in the WTC Towers had to migrate around the core of the building in order to reach the areas where initial failure was said to have occurred. So, in the North Tower for example, the plane hit the north side of the building and had to migrate around to the south face of the building where the initial failure – according to NIST – occurred. That migration time would have allowed for only about 45 minutes of fire at the failure zone. So, to expose their computer-generated segments to 90 minutes of fire, which is twice as long, at temperatures that far exceeded what the physical evidence showed, and stripping off all the fireproofing when there’s no evidence for that, is quite unbelievable. It gets worse than that, as I think you might have seen. KR: Well, those are impressive adjectives, but what we really need is evidence in order to support this critical story – this explanation that drives all public policy, or did at the time, in all of the wars. We really need evidence, and we need to be objective. KR: That’s right. I considered myself how quickly this instability would have had to spread, so I gave the example of the North Tower. If, on the south face of the Tower, the columns began to be pulled inward and therefore the building began to collapse on one side, then in order to see the uniform collapse that we saw – perfectly vertical, uniform collapse – that instability would have had to spread around the other walls of the building in approximately half a second, or less, of the ten-second fall time that we saw. Now, that’s twice or several times the speed of sound; it doesn’t make sense that that sort of physical deformation would be able to travel at that speed. JC: Then we’re left with this phrase: “global collapse ensued”. That looks like ‘no further questions asked’. KR: Yes, that gets us back to the fact that many of the questions are left unanswered. The buildings’ fall time itself, approximately 10 to 12 seconds according to NIST, seems to defy the idea of the resistance that would have come from the floors below. If each of the floors had caused a hesitation of just half a second, we would need another 40 seconds for the buildings to have collapsed. There should have been some sort of deceleration given the massive structure below, but we didn’t see that. Neither was there any mention of the things people call ‘squibs’, these cannon-like bursts of material that appear to be explosive effects that were occurring 10 to 30 floors below the collapse front. There’s no mention of the molten metal that was pouring from the building, or the rubble piles; and a lot of other evidence was just ignored by NIST simply not addressing the collapse dynamics. JC: Something that always sticks in my mind is a quote by David Coburn of Popular Mechanics. 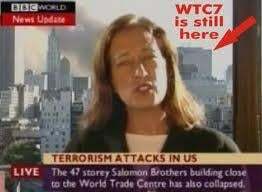 In the BBC’s Conspiracy Theory program on 9/11 (in 2007, I think), the presenter says, “But it does look exactly like a controlled demolition, to which David Coburn replies: “I understand why people might think that. I see what they’re saying, but when you learn the facts about the way the building was built, and about the way it supported itself, and the damage that was done from the collapsing towers that preceded it, the idea that it was a demolition just holds no water.” So, he was giving the impression that he really did completely understand how that building came down, but you’re saying that at that time, in 2007, NIST itself wasn’t sure. KR: That’s right. Shyam Sunder, who was the lead investigator for NIST, was interviewed for New York Magazine in 2006, and he stated they really didn’t know what happened to Building 7. Yet, a year later, you’re saying that a media representative – who I would assume is much less technically competent – was very well-versed on exactly what happened. This is the field of play that those of us interested in getting to the truth of the matter have to deal with: we’ve had the official investigations, and yet also these media representatives lobbing various competing and, in some cases, conflicting ideas to the public; and people trying to deal with all of that at the same time. JC: Yes, I’ll ask you about the details in a moment. Let me first ask: Is their idea in the report that the internal structure failed and fell ahead of the external structure, falling such that you could have this free fall? JC: Let’s concentrate on this thermal expansion, and discuss the shear studs as well. Could you explain how important these shear studs are to this whole study?Why did NIST say one thing at one time, and then seem to change its mind about it? KR: That’s exactly right. There are differences in the expansion capacity of the different materials. That would have created problems for the steel expanding differentially and causing the effect that NIST said that it did. There’s one other thing: there was some input to the NIST report after it came out from some professors in Australia who had actually tested the exact linear thermal expansion effect that NIST was citing; and they came out clearly saying that that was not their experience in their testing. They had done actual physical tests – the kinds of tests that NIST should have done – to see if this linear thermal expansion would have occurred; and it would not have occurred according to these professors from Victoria University in Australia. KR: Well, no I don’t necessarily say… Linear thermal expansion is not a new effect. It is something that can occur. All materials expand when they’re heated, but I’m not contending that that did occur in WTC Building 7 – certainly not from 20 minutes worth of fire, and not on fireproof steel components. I believe that it did not occur. But even if it had, the idea is that these beams composite with the floor would be susceptible to failure is something that these professors from Australia are challenging. There are certain restraints that do occur when these things are connected. It may be too complicated for us to get into in this interview, but basically the linear thermal expansion would not ever occur due to this restraining force from the floor slab. JC: You say it’s not possible to get hold of the data that they used for their computer modelling. Was this the request that was made, to which NIST responded by saying: We’re not going to give you this information because it might “jeopardize public safety”? Is that the one? JC: Is it right that with Building 7 they didn’t actually look at the possibility of thermite being used? I understand that Steven E. Jones had identified the residues of thermite before NIST’s final report on Building 7 came out. But I understand that they didn’t consider that. KR: That’s true. They were forced to make some statement in what they call a FAQ response. They made a kind of weak hand-waving statement about thermite, saying that if thermite had been used, their hypothesis was that it would have been used in one gigantic bomb placed right next to Column 79; and that would have been too much thermite for anybody to have brought into the building without anybody noticing. To me, that’s a kind of diversionary statement; it’s more a straw man argument. There’s great evidence for thermite at the WTC: molten metal; all of the witnesses to molten metal; the photographic evidence; the fact that the fires could not be put out for five months; the many witnesses to the air being filled with hot burning particles; the numerous vehicles in the area that were scorched by something; and a lot of other evidence, including peer-reviewed scientific research that I’ve helped to produce along with professor Jones. All this leads to the conclusion that thermite – highly-explosive potential – and also incendiary material was present at the WTC. What he did was an interesting sort of series of tests that had very little to do with the Harrit paper. The Harrit paper cites approximately ten specific tests that were performed on these red/grey chips; and Millett performed one of those ten tests. Then, something that was very indicative to me, he put them basically in a muffle furnace and ashed them; he brought them up to 400° Celsius and they turned to ash. One of the critical aspects of the red/grey chip analysis was that these chips ignite above 400° Celsius; so at 400° Celsius they would not have turned to ash, according to Harrit, at all. Then, at about 430 degrees Celsius, they would ignite and form these iron-rich spheres, that would form right out of the material itself. That’s an indication of a thermitic reaction, because one of the major products of thermite reaction is molten iron. Millette ignored all of that by putting his materials in a muffle furnace. Then he said they ashed at a temperature below what should have been the ignition temperature. So there’s a lot of questions about these series of tests that Millette did. It has not been peer-reviewed, and it hasn’t been published years later. People cite this unreviewed paper all the time, but what would be better for scientific progress (as with Harrit’s and Jones’s academic papers, that are peer-reviewed and published) would be for a published and peer-reviewed response to be forthcoming in future which actually does replicate the study, and doesn’t do this sort of thing, which doesn’t seem to be very helpful. KR: That does seem to be the case. Certainly the NIST WTC reports suggest that the NIST scientists – at least with this investigation – were led and directed by political interests. KR: Well, I think that people are more open to questions about 9/11 given that it’s been thirteen years since those events. As time passes, wounds heal, and people are not as invested in questions that might contradict their worldview from that long ago. Yes, I do believe we have an opportunity, even this year, to see a legitimate investigation. There’s an initiative in New York City called The High-Rise Safety Initiative in which citizens of New York City have submitted 60,000 signatures on a petition to the City Council of New York to call for the investigation of any high-rise collapse in the city; and this would go back to the events of 2001 – particularly Building 7. They’ve been challenged, because there are politicians in the New York City Council who are trying to reject that petition – to throw out more than half of the signatures obtained; right now there’s a battle going on. People can find the website for High Rise Safety Initiative just by searching on the Internet, and I think there are ways to help. KR: It would be a chance; it would be an opportunity to do a fair investigation – a legitimate investigation. JC: Well, Kevin, thank you ever so much for coming again on the programme. You’ve provided, as you did last time, a wealth of information for us. I think you’ve given us reason enough at least to question the work of NIST in this area; I think you’ve cast a shadow of significant doubt over the idea that the collapses have been satisfactorily explained according to the official story of 9/11. So, I do thank you very much indeed for sharing all this with us, and for coming on the programme again. It’s been good to speak to you.